Each of these methods can induce some level of stress for a sugar glider. It is important to evaluate these possible stress factors and decide which method will be best for the sugar glider. Local pick-up is by far the most preferred method of transporting a sugar glider. It typically means the drive time is minimal. When living in such close proximity to the breeder, many times the breeder will encourage several trips for you to spend time with your glider until it's old enough to go to your home. This is the least stressful way to get your glider. It has had some time to spend with you, and get to know you before it goes to your home. This method typically does not cause excessive stress to the glider. Please make sure that appropriate travel carriers are used during any type of transportation. Carriers should be protected by a seatbelt during transportation; preferably with a shoulder belt in the back seat. When the proximity isn't within a few hours, depending on the breeder, they may agree to meet part way. Usually the breeder will charge a fee to cover their gas and travel time. A pre-determined location is agreed upon with a specific meeting time. When meeting, each party should allow sufficient travel time to ensure punctuality. Prior to leaving, each party should exchange cell phone numbers to maintain contact during the trip. When meeting up, the breeder will turn over the glider and any paperwork to the buyer. In most cases, this is the first time the owner has met the glider. Depending on the distance, a hotel stay may be required. If this is necessary, please be sure to have a travel cage and cage accessories necessary for an overnight stay. Food and water for the glider will also be required. This scenario will be a bit more stressful on the sugar glider because it is going to a stranger, and has more hours of travel in the vehicle. Being in a small space can be stressful for a sugar glider. To try to minimize the amount of stress; plan vehicle travel to daylight hours when the glider is typically sleeping. If the overnight stay is required, this again may put additional stress onto the glider by being in another new place for the night, then having to adjust to their home once there. Please make sure that appropriate travel carriers are used during any type of transportation. Carriers should be protected by a seatbelt during transportation. Railroads are becoming a more common method of transportation used for purchased gliders. Historically, this method of transportation has been reserved for the placement of rescued gliders. This type of transportation takes an enormous amount of preparation. There are typically several individuals involved in the various "legs" of the route. The final type of transportation is shipping via air. This typically involves the breeder making shipping arrangements with the local airline. If this method is to be used, it is preferred to have a direct flight with no layovers. The glider will arrive at the airport in an appropriate glider-safe shipping container and dropped off at the cargo location. The glider will be placed into a temperature-controlled environment and flown to the destination. The new owner will need to be at the airport upon the flight arrival. Typically photo identification is needed to pick up the glider. Please open the shipping crate to ensure the well-being of the glider prior to leaving the airport. Tools will be required to remove the zip-ties to open the shipping crate, such as a screwdriver or pliers. At this point, the glider makes its final trip in the vehicle to its new home. This type of transportation can also cause a lot of stress to the glider. It will be placed into a cargo area of the airport and airplane with lots of new sounds, smells, and other animals it is not accustomed to. 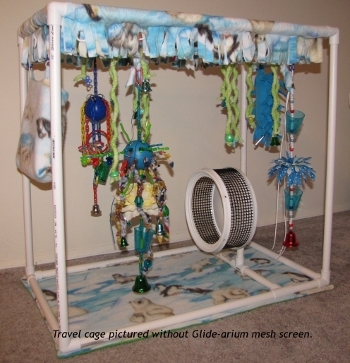 When shipping a sugar glider, you should have a cage or bonding pouch for the gliders to travel in. Some breeders prefer to add fleece blankets in the pouch for the gliders comfort. The pouch should be large enough for the quantity of gliders being shipped to comfortably sleep just as if they were in their permanent cage. If you are using a bonding pouch that zips or ties closed, it should be open during shipping. If the temperatures are low, you may want to add heating pads in the pouch. These heating pads should be in their own small pouch that will close (with a flap or drawstring) to avoid direct contact with the sugar gliders. If you are shipping with a heat pad, you may want to offer a second cage pouch in the shipping crate, one with the heating pad and one without. This will allow the glider to move to or from the heat as they need. If it is warm out, do not include these when shipping. Consult with the airlines as some have climate controlled areas, therefore heat pads may not be necessary with that particular airline. Food that will not spoil, or cause too much of a mess, should be added into the cage. Items such as sliced apples or grapes offer the sugar glider a moist food to provide hydration during shipment. The cage or bonding pouch should be hung inside of a small, yet secure cage or Kritter Keeper®. This will allow the glider to come in and out of the pouch as necessary. This cage should latch closed, if it doesn't latch securely, use zip ties to secure it. 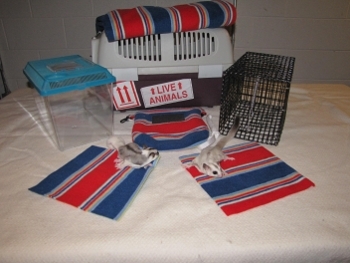 Place the small cage with gliders enclosed into an airline approved shipping crate. Place fleece around the small cage, and then add more fleece or other packing material around the cage to prevent it from sliding around during shipment. If you are using packing material such as newspaper, ensure the glider cannot get to it. Once the interior cage is secure, close the shipping crate. Upon arrival at the airport, you may need to show them the health certificate. Once they have seen the paperwork, place it inside the shipping crate, ensuring the sugar glider cannot access it. Typically, the airline will then secure the shipping crate closed with zip ties. Paperwork, labeling, and payment will be made at that time. Make sure you take photo identification when shipping your gliders. With any of these methods of transportation, various issues can stress the sugar glider. Some individuals strongly believe vehicle transportation is the only safe method, while others feel all methods are safe. Regardless of personal opinion, we need to recognize the potential stress factors with each method. When you receive your glider, you need to recognize if it has been severely stressed on its journey and work with it accordingly. Regardless of how the glider was transported or shipped to you, give it a few days to adjust to its new environment prior to starting the bonding process. If you feel your glider is sick, please seek immediate veterinary assistance. The information on this page and in the correlating articles is for general educational purposes and is not intended to replace proper vet care. Please do not try to self-diagnose or self-treat your glider.